You are here: Home / 5. Practicalities / 5.1. 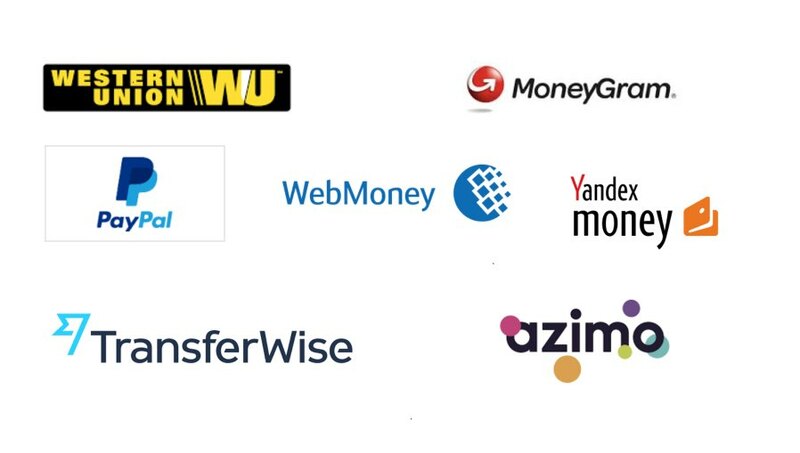 Ruble exchange and prices / How to send money to Russia: WesternUnion, PayPal or TransferWise? For comparative purposes, all calculations were made on February 15, 2017. Well, sending 300 GBP to Russia through Western Union has a commission of 9.90 GBP if you send it by bank transfer and 29.90 GBP if you send money by debit or credit card, but the main problem is that it applies a very unfavorable exchange rate. This means that if you send 300 GBP to Russia today, you would be charged an exchange rate of 68.7990 RUR/GBP, so that the recipient in Russia will receive 20,639.70 rubles. Firstly, when it comes to international personal money transactions to Russia, the commission is not free, as PayPal charges a fee of 0.5% if it’s being sent from a bank account, and 3.9% if it’s sent from a credit card, whether debit or credit. In the case of commercial transactions, commissions are even higher. You can consult the commissions at this link. Secondly, when you send pounds to a recipient in Russia, Paypal applies a rather unfavorable exchange rate. Today it applies an exchange rate of 68,1712 RUR/GBP, very far from the real exchange rate of the day. Thus, if you send 300 GBP to a relative or friend of Russia, the commission would be 1.5 GBP (12 GBP if you use your bank card), but your friend or Russian family member would receive in its Paypal account a total of 20,451.38 rubles. Also, keep in mind that if the recipient wants to transfer this money to its Russian bank account, it would have to wait a couple of days to have the money available. 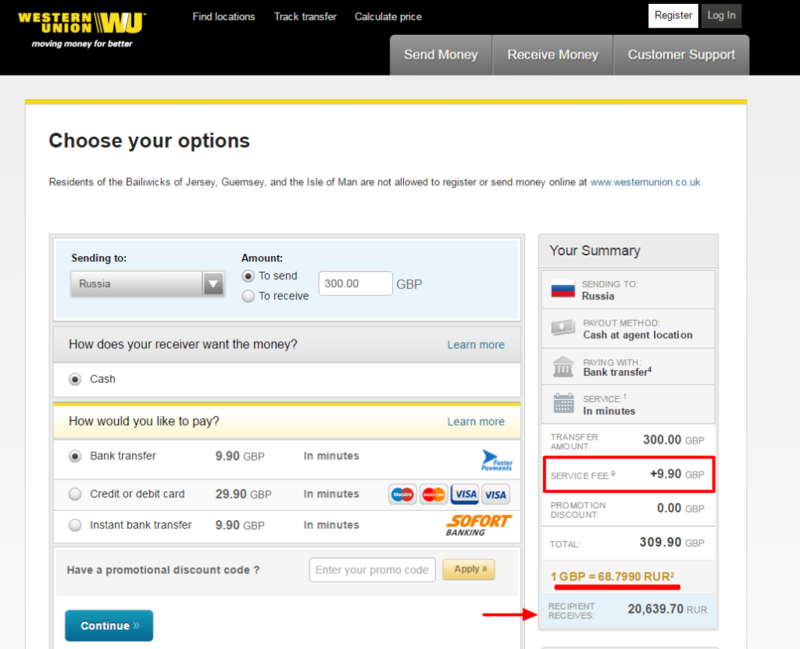 Western Union: you send 300 GBP and the recipient in Russia receives 20,639.70 rubles (in addition, you have to pay a commission ranging from 9.90 GBP to 29.90 GBP). 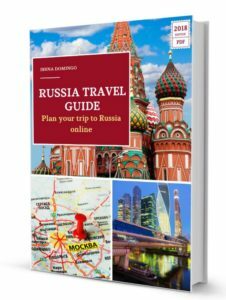 PayPal: you send 300 GBP, and the recipient in Russia receives 20,451.38 rubles (in addition, you have to pay a commission that varies between 1.5 GBP and 12 GBP). 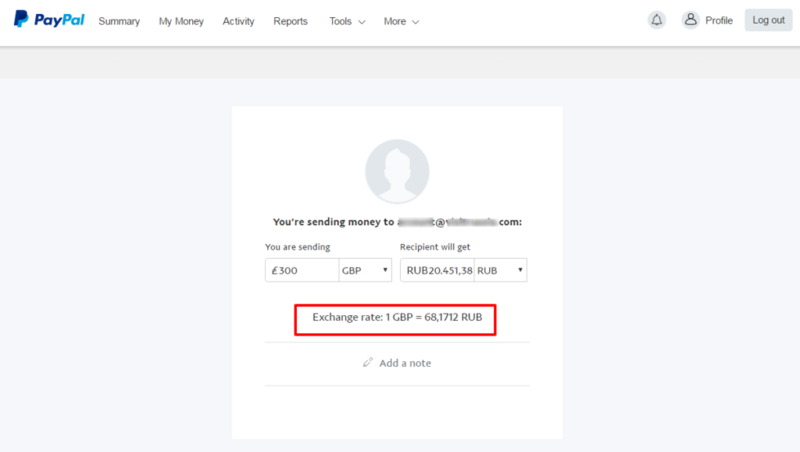 TransferWise: you send 300 GBP and the recipient in Russia receives 21,145.05 rubles (with the commission already discounted of this amount). All calculations were made on February 15, 2017. As you can see, the price differences are very large between these different methods.